It's difficult to wrap your head around how much data is being stored out there - every click, every email, every Instagram post - is recorded and saved on a server. In fact, by 2017, global IP traffic will cross the zettabyte threshold. This skyscraper, located in Iceland, is designed to address the question of where all of that data will be stored. 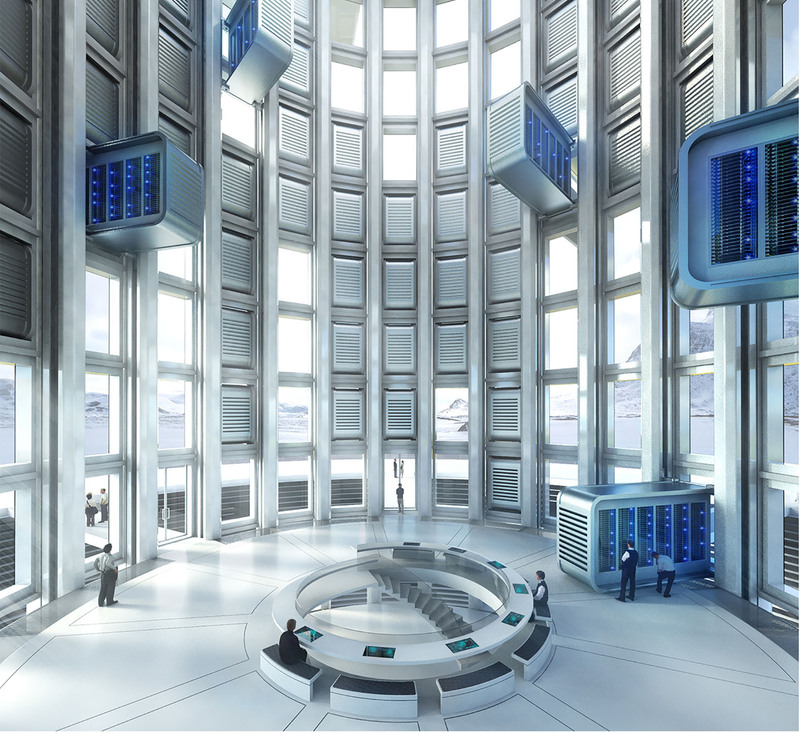 The tower acts as a massive cylindrical motherboard that can store massive amounts of data in a sustainable way. The concept is designed to be located in Iceland for several reasons: first, the cooler temperatures in Iceland help to keep the tower naturally cool. Iceland is also conveniently located between Europe and the US – two major consumers of data. The country is also abundant in green energy, so the data center could be 100% powered by sustainable sources. The tower is hollow, with all components fastened to the exterior. The hollow interior helps cooling air work more effectively and allows space for maintenance. Heated air is either expelled out of the top of the cylinder, like a chimney, or re-used by the laboratories and greenhouses located in the basement space. 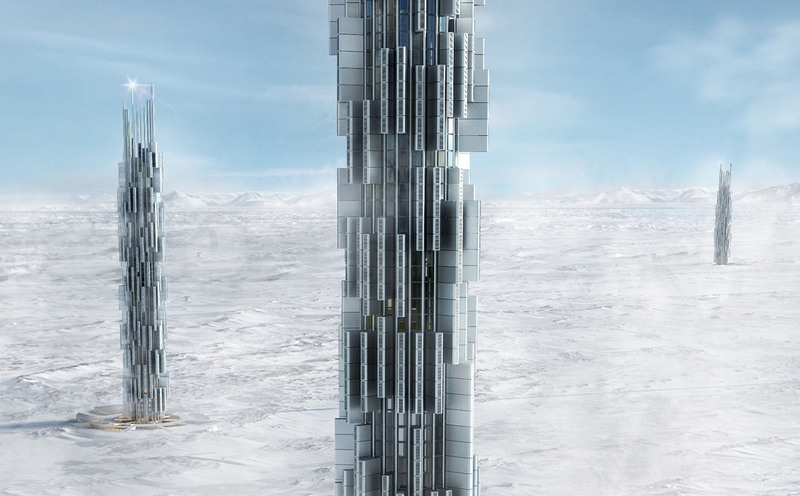 The concept won third place in the 2016 eVolo Skyscraper competition. The design was created by Valeria Mercuri, Marco Merletti. The concept is designed to be located in Iceland for several reasons: first, the cooler temperatures in Iceland help to keep the tower naturally cool. "Our project is a vision of how could it be a future green data center located in Iceland. A data center is often a large industrial building without a significant architectural connotation, a big anonymous container. The main issue of our project is to investigate a new morphological solution that could represent both the complexity and the importance of the building into which we keep our data. Above all, we conceive the data center’s configuration in order to maximize the use of the available renewable energies and also to allow the re-use in a sustainable way." Iceland is also conveniently located between Europe and the US. The country is also abundant in green energy, so the data center could be 100% powered by sustainable sources. 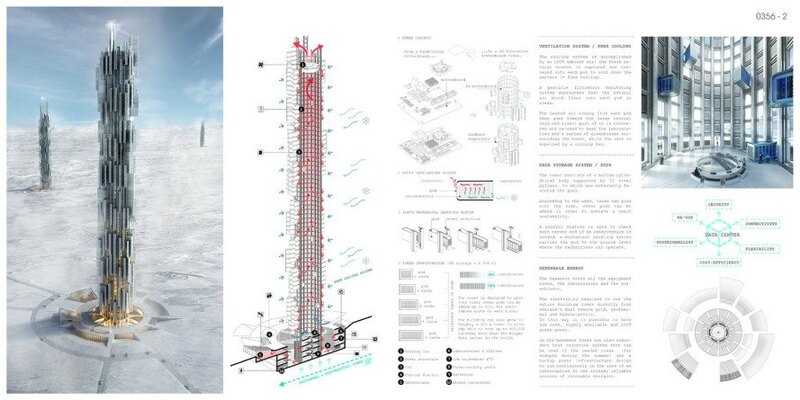 Sustainable data center tower in Iceland.